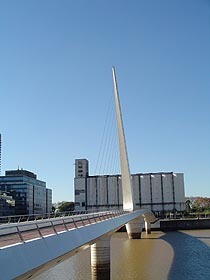 Donated by Alberto L. Gonzales and his family to this city of Buenos Aires, Santiago Calatrava's Puente De La Mujer (Bridge Of The Woman) is the architect's only work in South America. The 335-foot-long suspension pedestrian bridge is broken up into three sections, two static and one mobile. The central portion of the bridge was designed to rotate 90 degrees to allow water traffic to pass, with the two static portions connecting to pedestrian streets on either side of the dam. Most of the bridge's weight rests upon its central support, in which motors are located allowing the bridge to rotate. The bridge was primarily built in Victoria, Spain and taken to Buenos Aires in parts over five months. In its design, Puente De La Mujer is somewhat related to the Alamillo Bridge in Seville in its radical asymmetry and expressive tension, though its scale and angles are admittedly less grandiose and its asymmetry is reversed from the Seville bridge. 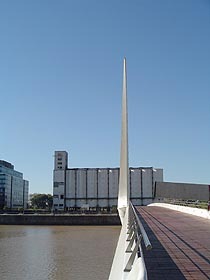 Calatrava is said to have requested examples of Argentina's typical music upon receiving this commission. As a result, the bridge is abstractly meant to illustrate a couple dancing Tango, the man towering over the woman who is leaning back horizontally. This, along with the fact that the surrounding neighborhood has streets primarily named after women accounts for the name of the bridge. $6 million bridge) to maintain it. The bridge is thus not operating, while its upkeep is sorted out. 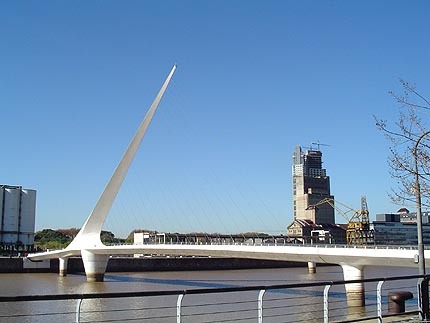 In the meantime, the bridge gives Puerto Madero a beautiful modern counterpoint to its brick industrial buildings which have recently been rehabbed to house restaurants, shops and lofts. 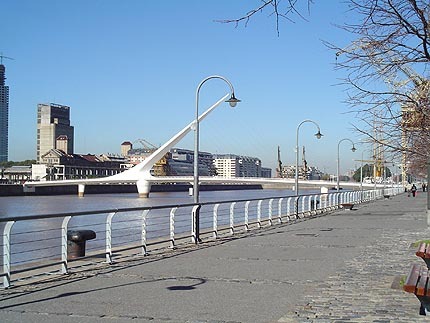 Puente de la Mujer is located in Puerto Madero, only a few blocks directly behind (east of) the "Casa Rosada", which is the President's palace. Take subway (Subte) Line C to "Plaza De Mayo" stop, or Line B to the "LN Alem" stop, and walk east towards the dams. Calatrava's own web site describes the bridge at www.calatrava.com. See also the local area site at www.puertomadero.com (English site available), or construction pictures and blueprints at www.construir.com.